To begin with, there's a surprise for anyone who launches either Automator or AppleScript Editor. The first thing you'll find is that both apps were updated with iCloud compatibility. 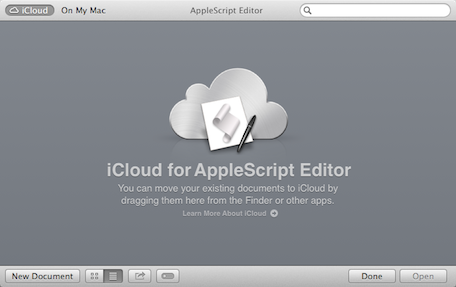 AppleScripts that you've created or Automator workflows can now be moved into the cloud and synced to all of your Macs that are running OS X Mavericks. Sure, that's a little thing, but it's useful if you're creating and updating scripts or workflows that need to be deployed to a handful of Macs automatically. Now this is cool. Let's say that you have code that can be used in a number of scripts. Now you can create an AppleScript Library, which is a script that contains a frequently used routine. Store that in ~\Library\Script Libraries\, and now any other script can use that code by simply calling it with a new use clause. Write once, use many times. Blogger Don Southard over at MacStories has a good example of how to use libraries in his writeup of scripting and automation improvements in Mavericks. This may not sound like a big thing, but it's huge. Apple developers can now generate signed copies of applets and droplets as part of the export process in both AppleScript and Automator. Signing these applets means that users launching them will not get the usual Gatekeeper security warning, and adds an incentive for developers to include easy automation tools in their solutions. Now here's a wonderful addition for those who are creating accessible solutions. If Speakable Items is activated in the Accessibility system preferences, Automator adds a new option to the save dialog to save applets as Speakable Items. With that one click, those items are saved to the Speakable Items architecture and can be executed by speaking the name of the applet. This is just what I've been able to find -- or not find -- in a cursory look at Maverick's automation tools. As more capabilities and deletions become apparent, this post will be updated. I'd also recommend taking a look at MacOSXAutomation.com, which is always helpful and useful when you're considering the use of the built-in OS X automation tools.